"Dragon in the Den" (1963). 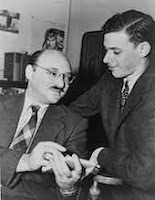 James Yaffe, who sold his first story to EQMM at age 15 and was a longtime English professor at Colorado College, died on June 4 at age 90. One of his characters was Mom, who solves cases for her policeman son over dinner (she appears in A Nice Murder for Mom, Mom Meets Her Maker, and Mom Doth Murder Sleep, as well as in the Crippen and Landru collection My Mother, the Detective). Yaffe's other works include plays ("The Deadly Game"; "Cliffhanger"; "Dear Me, the Sky Is Falling") and screenplays for such TV series as Studio One, the U.S. Steel Hour, and the Alfred Hitchcock Hour. Another of his episodes was "Dragon in the Den" (1963) for the TV series Channing, which features William Shatner as a candidate for state attorney general who discovers there's no such thing as a clean campaign. Costarring are Henry Jones as Channing dean Fred Baker, Jason Evers as a Channing professor, and Denver Pyle as Shatner's campaign manager. Pulp cover art exhibition in Florida. At Florida International University's Wolfsonian until July 9 is the student-curated exhibition "In the Shadows; American Pulp Cover Art." 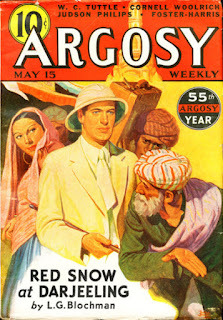 Included are covers from Argosy, Detective Fiction, Detective Novels Magazine, G-Men Detective, and Popular Detective. Wolfsonian chief librarian Frank Luca discusses the exhibition and the students' research aims here. Remembering Adam West: The Detectives. Although Adam West, who died June 9 at age 88, is best known for his portrayal of the Caped Crusader, he had a long series of other television appearances. One was his role as Detective Sergeant Steve Nelson in The Detectives, the series starring Robert Taylor as head of a squad of city detectives and featuring writers such as Anthony Boucher and Gene Roddenberry. In "Strangers in the House" (1962), Nelson and his colleagues look into the case of a night watchman run down by a gang of young car thieves. Sharp-eyed viewers will spot Tige Andrews (The Mod Squad), John Karlen (Cagney & Lacey), and Chris Robinson (General Hospital) in the cast. The first hundred years of detective fiction. 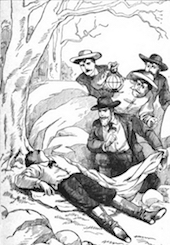 A valuable resource is the Lilly Library of Indiana University's online version of its 1973 exhibition "The First Hundred Years of Detective Fiction, 1841–1941," which provides a useful history of the genre through the works selected. Besides the expected items by Edgar Allan Poe, Wilkie Collins, and Arthur Conan Doyle, there are works by lesser known authors such as William Russell (the rare Recollections of a Detective Police Officer, 1856–59) and Lawrence L. Lynch (pseudonym of Emma Murdock Van Deventer, 1885). Other goodies include G. K. Chesterton's sketch of Holmes and Moriarty for a never published version of Conan Doyle's "The Final Problem," a manuscript page from S. S. Van Dine's The Scarab Murder Case (1930), and Georges Simenon's first two novels. Note that the statement "It was not until eleven years later, in 1878, that the first native detective novel appeared in America, Anna Katherine [sic] Green's The Leavenworth Case" is not true, as Metta Fuller Victor is now given this distinction for her novel The Dead Letter (1866). Out of the Fog (1941). 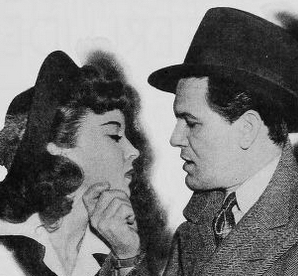 When racketeer John Garfield leans on fishing boat owner Thomas Mitchell and his friend for protection money and romances Mitchell's daughter (Ida Lupino), the men begin to think of murder. The film is based on the play "The Gentle People" by Irwin Shaw (The Young Lions; Rich Man, Poor Man). I talk to Joan Hess in Publishers Weekly about The Painted Queen, the last novel of Elizabeth Peters (aka Barbara Mertz, 1927–2013) completed by Hess after the death of Peters. Woman in the Window (1944). 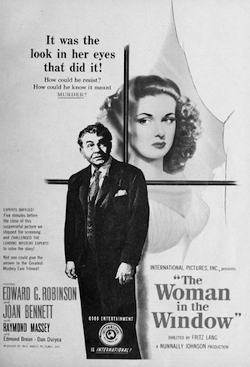 In Woman in the Window, a married professor (Edward G. Robinson) finds himself entangled with a woman (Joan Bennett), blackmail, and murder. Raymond Massey and Dan Duryea costar. Directed by Fritz Lang, the film is adapted by noted journalist-screenwriter Nunnally Johnson from the novel Once Off Guard by J. H. Wallis. 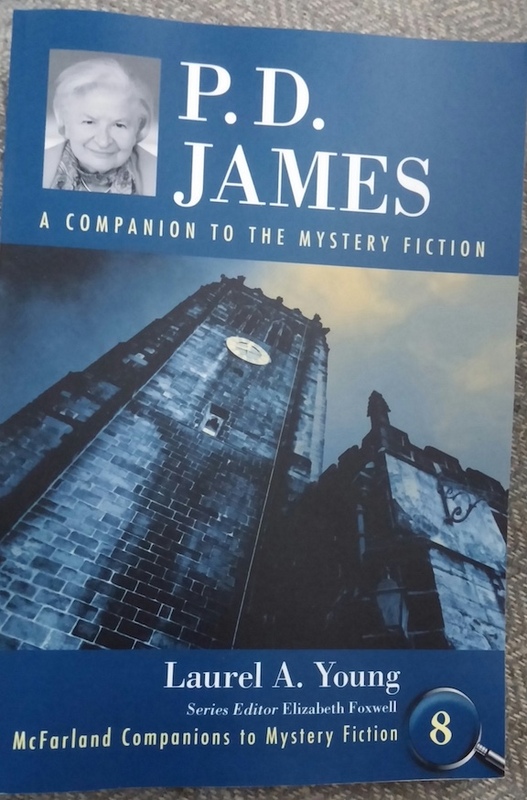 P. D. James companion published. 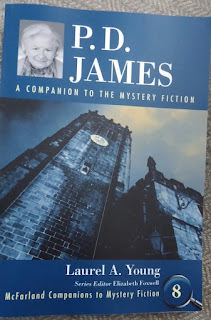 Just published is P. D. James: A Companion to the Mystery Fiction by Laurel A. Young, vol. 8 in the McFarland Companions to Mystery Fiction series that I edit. Young, who wrote part of her dissertation for Vanderbilt University on P. D. James (1920–2014), teaches English at a high school in Raleigh. The book provides a comprehensive treatment of Baroness James's Adam Dalgleish and Cordelia Gray works, her essays and book reviews, and other aspects of her life such as her admiration for author Anthony Trollope.